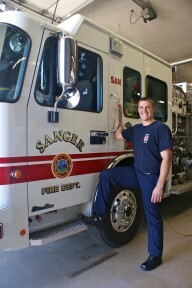 The Sanger Fire Department hired three new firefighter/paramedics this past July. The three new firefighter/paramedics who will be making sure Sanger residents are safe are: Andrew Askew, Dominick Foster and Joseph Montejano. 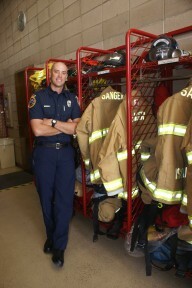 Sanger firefighter/paramedic Andrew Askew stands by his locker where his gear is stored. The hiring of two firefighter/paramedics and one for ambulance benefited from Measure S. “We were very fortunate we were able to bring in three new guys,” continued Tarascou. According to Tarascou, the testing process was extremely complicated and 85 people showed up for that portion of the testing. Once the written test was passed, there was an agility test and an oral interview with a final point tally given after all the testing. “We took the top three that scored the highest points, straight off the list.” The list that was established will be in effect for one year and be used in the future should the need arise. Askew has served with Fresno County Fire Protection District as a Fire Apparatus Operator on a part-time basis and he also worked for Cal Fire for one season. 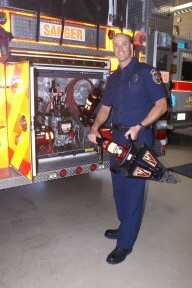 “I started my firefighting career, here, as a volunteer, with the City of Sanger, in 2008,” said Askew. Andrew Askew checks out equipment on the fire engine. Askew stated that the firefighting team is nice and inviting. Being at the Sanger Fire Station, “Feels like home.” One of the biggest challenges Askew faces is to remember his role as a probationary firefighter. 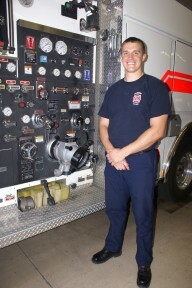 “As a first year rookie fireman I need to make sure I’m busy all the time,” said Askew, who also said he needs to make sure not to step outside his boundaries and to keep up on his training. Sanger firefighter/paramedic Dominick Foster checks the engine gages. The biggest challenge facing Foster right now is having to gain fire experience. “There is a lot more that goes into the job than just, let’s put water on the fire. There is a lot of science behind the stuff that we do, that can hinder our operations or help us,” added Foster, who said there is a lot to learn and he needs to be patient. Dominick Foster gets ready to go out on a call. Foster enjoys the community of Sanger because the community is receptive to what the department has to teach and everyone is friendly. He likes the community of Sanger so much that he and his wife have been thinking about moving into the City. For now, Foster is concentrating on learning and adjusting to his new job. 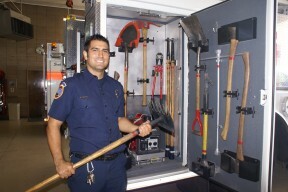 Sanger firefighter/paramedic Joseph Montejano gets the ambulance equipment ready to go out on a call. Montejano, like Foster, feels the smaller department has benefits. “The fact that I will have the opportunity to wear so many hats here. I can be part of the rescue team, I can work on the ambulance, I can be on the engine the next day.” He would also like to get involved with the arson investigation program. Married for two years, Montejano and his wife have a 13 month-old child and his wife is expecting their second child in October. Askew, Foster and Montejano say that working in the City of Sanger is great because of the feeling of family and the ability to help people. “That means a lot to me. To be able to help not just that individual, but helping the whole community,” said Foster. All three new firefighters agree there are misconceptions about what a firefighter does. The perception may be that firefighters sit around all day until the tone sounds. “There is a lot of work that goes into it behind the scenes, there is a lot of maintenance to keep these rigs going,” said Askew, who also stated that there is time spent on physical training and education and the maintenance on the firehouse as well. Watch KRL for more Sanger articles from Cheryl. Cheryl Senn is a freelance writer/photographer, a mother and local business owner, and is also involved with many community service organizations in and around Sanger. People can visit www.facebook.com/thesangerscene to see what is happening with the author and Sanger. Hi. I trying to reach a captain of yours by the name of Todd. I met him and his wife Melissa while staying in Avila, and I have missed place the info they gave me. Could you please forward this to him? Much appreciate it. Thank you. Bill Smith, retired Fire Chief, Running Springs Fire Department. Hey, congratulations to the three new probies! Becoming a firefighter is a great service to the community. 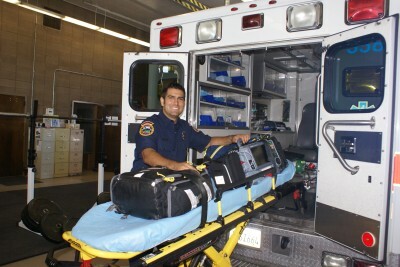 Being both a firefighter and a paramedic is a challenge, but I’m sure you’re up to the task. I wish the three of you all the success and a long, healthy, and prosperous career!